This optical illusion was discovered by accident. A patterns of squares with smoothly-varying color was created, and then the colors of the "even" squares were converted to their color complements. A more extensive background can be found in Gallery 7. The image appears to have "topgraphy" with some regions seeming to be closer than others. Because of the complementary colors the eye-brain system tends to see gray. 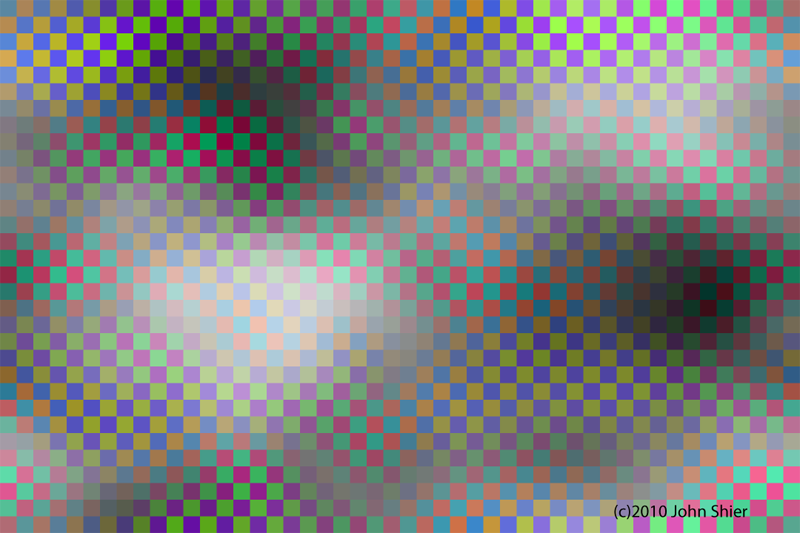 And the image shows "shimmering" and "motion". Unlike other illusions which rely on wavy lines, this one has simple vertical and horizontal boundaries. The grayness is emphasized if you shrink the image, and goes away if you blow it up large enough.